Imposing performances, displays of great authority, Nigeria’s Quadri Aruna followed by Singapore’s Gao Ning emerged successful at the semi-final stage of the Men’s Singles event at the Gold Coast 2018 Commonwealth Games on Saturday 14th April. Quadri Aruna, the top seed, beat India’s Sharath Kamal Achanta, the no.4 seed (12-10, 11-9, 11-9, 11-7); Gao Ning, the no.3 seed, overcame England’s Sam Walker, the no.8 seed (11-5, 11-5, 13-11, 11-4). A good start, Quadri Aruna gained the ideal start; a close first game, he won the vital points; it was the same in the second and third games. However, once the third game was won confidence grew, a most efficient and professional performance was completed. Success for Quadri Aruna was followed with success for Gao Ning who showed glimpses of the form displayed in London at the 2011 ITTF World Tour Grand Finals when he beat Korea’s Ryu Seungmin followed by China’s Ma Lin, at the time the two most recent Olympic champion. Guiding the ship was Singaporean national coach, Liu Jiayi; he had worked out the tactics to perfection. 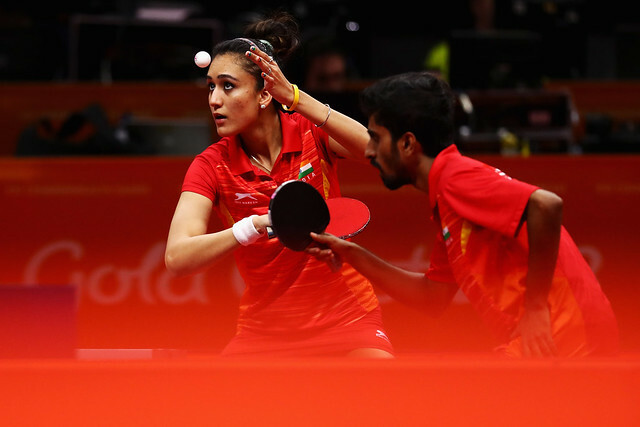 The gold and bronze medal matches will be played on Sunday 15th April; the bronze medal contest is scheduled for 11.30 am, the gold medal duel which will bring the table tennis events at the Gold Coast 2018 Commonwealth Games is scheduled for 12.20pm.